Located in Marina Beach, on the Golf Coast, the Hooting Owl offers a unique Bushveld Lodge feel in a coastal environment. We are LGBT & Naturist friendly. Discretion & privacy guaranteed. The main house nestles on a slope overlooking a sub-tropical forest with valley views and prolific bird life. We offer privacy, peace and tranquillity for that intimate weekend getaway or an extended break to unwind from the Rat Race. Wood-Owl Lodge, sleeping up to six people sharing has three queen rooms under thatch. Each room has an en-suite rock effect shower, rock effect basin and a toilet. There are cooling fans in each room. The rooms are located on a separate wing with their own entrance, overlooking the pool. The 100% percale linen, goose down pillows and duvets are of excellent quality to European standards. The linen and bedding is standard throughout the guest house. The communal area of this unit has a very comfortable TV lounge overlooking the pool with Compact bouquet DSTV. The kitchen is equipped for six with gas/electric hobs, double oven, large fridge/freezer, micro-wave & dishwasher. Wooden decks overlooking the forest surround the extra large, rock pool which can be heated in winter on request for an additional fee. A change room, toilet and two showers are located next to the pool and all weather barbecue area. The Scops-Owl Suite has its own entrance, via a private patio, ideal for a sun-downer or braai. The suite has rustic features in a modern style with a queen size bed, en-suite glass shower, modern basin and toilet. A small fitted kitchen, with stove, microwave, toaster, coffee machine and all utensils and crockery. There is a small dining nook and TV area with Open View HD or it can be used as a DSTV dish connection. Guests must supply their own decoder and equipment to activate DSTV. This unit is ideal for a private romantic get-away with your soul mate. 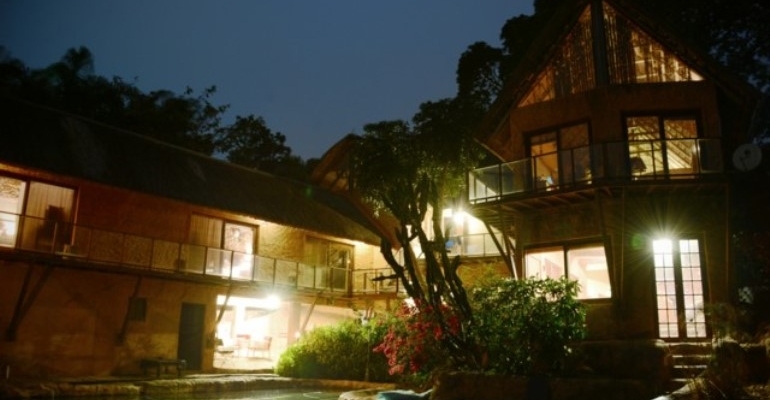 The Eagle-Owl Cottage is double storey, accommodating up to a MAXIMUM OF EIGHT people - including children. On the ground floor the master bedroom with queen-size bed and en-suite bathroom boasts an outside shower area in a secluded garden. The second bedroom also with a queen-sized bed is next to the second shower room. An open-plan kitchen/dining/TV lounge area completes the downstairs floor plan. There is Open View HD TV or a DSTV Decoder connection. Guests must supply their own decoder and equipment to activate DSTV. The kitchen is fully fitted with stove, oven, dishwasher, microwave, toaster and has utensils and crockery for eight people. Upstairs, there is a very spacious third bedroom with four three-quarter sized single beds. Member of the B&B Network Stay South Coast. Booking essential for Naturist / Nudist stays. Laundry done in house by housekeeping at additional cost. NO VISITORS ALLOWED. FACILITIES ARE FOR RESIDENTS ONLY. From R 300 per person per night sharing. Long term block bookings and group discount on request.